Look no further for a reliable and practical solution to your seating needs. 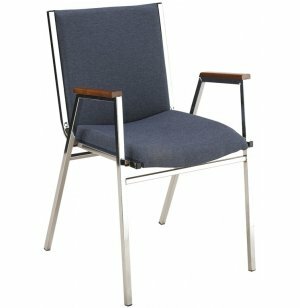 This multi-purpose stacking arm chair by KFI, is strong, convenient and comfortable. The sturdy functional frame is made of 3/4"-square tubing of 18-gauge steel. Front and rear 5/8" stretcher bars add extra strength to the structure of this chair. The 2"-thick upholstered seat offers a high level of comfort. For extra support, there are wood arms. To keep rows of chairs in perfect order, wire ganging is available. When it's time to clear the room, this chair can be stacked 10 to 12 high for ultra-convenient storage. 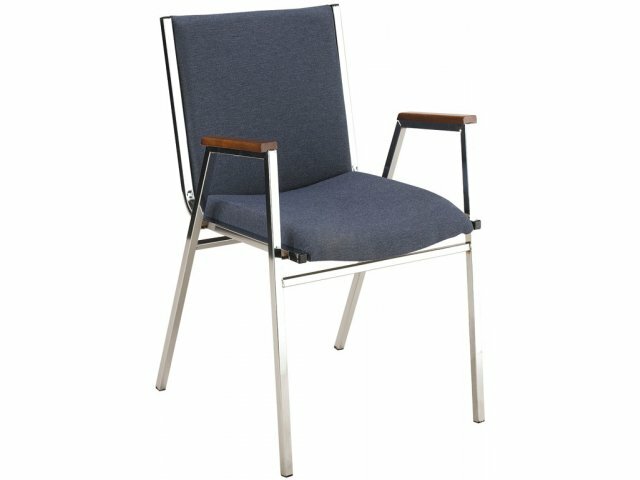 Seats and backs are available in a variety of fabrics, and frames are available in a choice of decorative finishes. Supreme comfort: 2"-thick upholstered seats provide a high level of comfort. Wood arms provide even more support.